This final module was full of emotion. 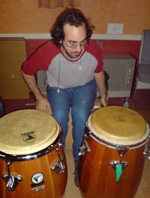 Participants had spent over 2 years studying a range of Afrocuban percussion, learnt dozens of songs for different styles of music, discovered many new instruments and developed both on a professional and personal level. The intense journey was full of highs and lows for all who took part. Sometimes struggling with the material presented and often putting pressure on themselves, these participants went the distance and can be proud of what they achieved. 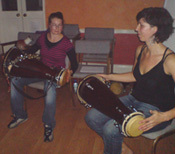 By the end of the courses every individual gained more self-confidence, rhythmic awareness and grew as percussionists and musicians. We revised a lot of material from the past, played through a repertoire of rhythms we’d covered and there was plenty of new material too. All in all it was a truly special week of celebration!